Having recently acquired a lute, I have been exploring some previously unknown (to me) corners of Elizabethan song, a very old interest of mine. When I was fifteen, two years into learning classical guitar, I spent the summer at a music professor’s house my parents had sublet in Berkeley. In the basement study I first came across the Davison/Apel Historical Anthology of Music, the Auden/Kallman Elizabethan Songbook, and other treasures, some of which I have to this day (not the professor’s copies, I hasten to add). I spent a good part of the summer sitting in that basement, copying out in pencil onto score paper the tablatures from a facsimile edition of Robert Dowland’s Varietie of Lute Lessons. Those copies (it was before photocopiers were everywhere) I still have too, or most of them. The music I had some understanding of, having tried to play it on guitar, but the poetry was new to me. I’d had a little Shakespeare in school, but lyrics like “in darkness let me dwell” and “Flow not so fast, ye fountains” were more exciting than anything some English teacher was trying to spoon-feed me, and they came with music besides! Though it was years before I really started singing them. By that time I was writing poetry myself, and knew enough about it to see that not all Elizabethan song texts were on such a high level. Still the overall level, compared to other periods of songwriting, was high indeed. Dowland has texts that sound like a pastiche of Donne or other well-known poets, and many have suspected that he wrote at least some of his lyrics himself. If so, he didn’t do too badly. What songwriter today would use such models? He may not have been a “real” poet like Campion, but he knew what poetry was. Still, there’s always going to be a special interest in how lyrics by the top poets of the day were set, or at least you would think so. In fact, many of the extant settings are still surprisingly little known, even after a half-century of early-music revival (or in this case more than a century, since by 1912 Arnold Dolmetsch had already begun building his lutes and viols to explore this very repertoire). The song I’m going to talk about now is perhaps not a “setting” at all. In fact the words are generally assumed to have been written to pre-existing music. 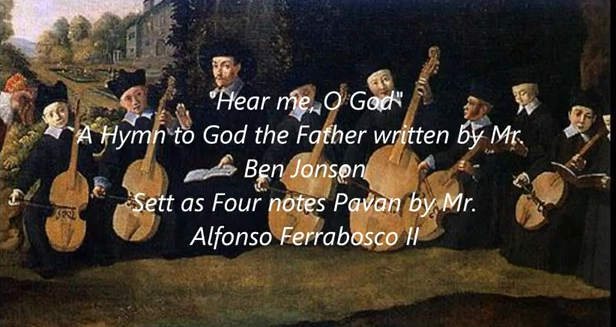 I’m speaking of the so-called “four-note pavan” of Alfonso Ferrabosco the younger (1575-1628), written for viol consort but in recent years also very popular in arrangements for brass, woodwinds, recorders – any kind of ensemble in which a sonorous, closely woven polyphony sounds to advantage. But the song version, on a text by Ben Jonson, seems to have been made by the poet himself. You are currently reading Two Old Hymns at Spoken and Sung.